School will be out soon in the Las Vegas valley and some parents still make be looking for affordable child care options. Marissa Kynaston reporting. UPDATE: For many parents, summer day camp is their only option. School is out, but many parents still work, and they need an affordable place to send their kids. 13 Action News looked into dozens of summer camps all across the valley. We found most camps are offered for right around $150 a week. Private organizations and specialty camps are more expensive, and could cost you about $500 a week. If you're looking for more affordable options, stick with city and county programs. Most of the camps we found were well under that $150 range. 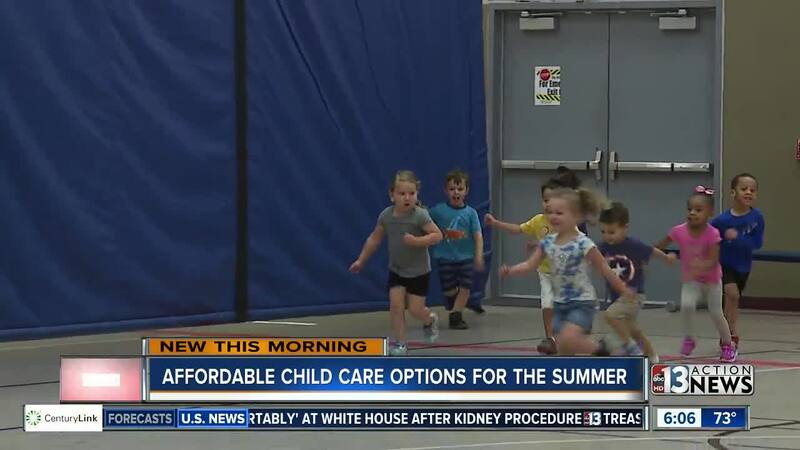 Clark County offers summer camp starting at just over $80 a week. Some camps also accept Urban League for lower-income families. You can find the application here . In addition, the Clark County School District is providing parents with a list of activities and resources to keep students buys and learning. Parents and students can visit ccsd.net/summer, a one-stop Web page with information on a variety of topics including summer classes, food service programs, FACES, Safekey partners, summer camps, summer safety, back-to-school fairs and even hiking trails in Clark County. ORIGINAL: Clark County Parks and Recreation is offering a number of summer day camps for kids. The county announced seven recreation centers will offer Summer Break Day Camps for children ages 6-12. Day camp is $18 per day or $85 per week and children can be registered here or at the individual recreation centers offering day camps. The camps will take place May 29 until Aug. 10 from 7 a.m. to 6 p.m. Availability in the program fills quickly. Registration will be processed on a first-come, first-served basis. Payment in full is required to reserve a spot. CCAP (Las Vegas Urban League) is accepted, but parents must provide a current certificate of benefits designated to specific site the child will be attending. Participants are required to bring a lunch and two snacks that do not need heating or refrigeration. At select locations, participants will be provided breakfast and lunch. For more information on Spring Break Day Camps visit here or call 702-455-8200 or email CCParks@ClarkCountyNV.gov.